The 29-year-old was captured following an expansive manhunt. 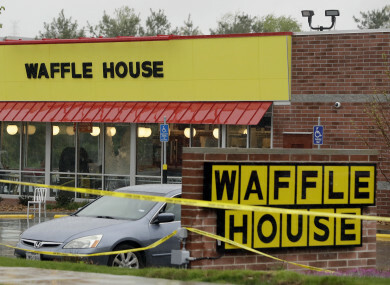 POLICE IN THE US state of Tennessee have captured the suspected gunman who killed four people in a shooting at a Waffle House restaurant in Nashville, America’s country music capital. “Murder suspect Travis Reinking is in custody. Arrested moments ago,” Nashville’s police department tweeted. The 29-year-old was captured following an expansive manhunt, as authorities scoured an area around the shooter’s home and the site of the shooting in which four were killed and two others wounded early yesterday. The Metropolitan Nashville Police Department said earlier that Reinking – who reportedly had exhibited delusional behaviour in the past and was arrested last year for trying to enter the White House grounds – was last seen on Sunday morning near a wooded area behind his apartment complex. He is accused of opening fire at the restaurant in the early morning hours of Sunday, while dressed only in a jacket. He was stopped by James Shaw, 29, a restaurant patron who wrestled the gun away. “Shaw’s actions undoubtedly saved many lives,” the police department said. Reinking then shed his jacket, and is believed to have gone back to his nearby apartment home, put on a pair of trousers and fled shirtless, according to police. Email “Waffle House shooting: Suspected gunman arrested”. Feedback on “Waffle House shooting: Suspected gunman arrested”.